Members of Elias Ashmole Chapter No 148, with visitors and guests, met on a wet, spring evening for their installation at Warrington Masonic Hall. Barry congratulating John on his promotion after the ceremony. The present first principal Gary Oates and fellow principals opened the chapter efficiently. The companions were then honoured with the presence of the principal guest for the evening, Second Provincial Grand Principal Barry Jameson. He came with a number of attendees; grand officer, Stan Churm and acting Provincial grand officers, Mark Barton, David Case, David Anderson and Andy Barton (Warrington Group Chairman). The three principals welcomed all the guests well, and this was returned by Barry. First business of the evening was to introduce a joining member, George Range, who was given a warm greeting. During the ceremony, Gary Oates was proclaimed as first principal, Andrew Anderson as second principal and George Range as third principal. Gwilym Jones organised and managed the evening with his usual aplomb. Robe addresses were given: to the first principal by Chris Gleave, to the second principal by Matty Oates and to the third principal by Stan Jackson. Gary then invested his officers for the ensuing year. The fact that there are eight stewards in this chapter (six in attendance on the night) attests to the secure future for Elias Ashmole Chapter. Addresses were made to the three principals by Derek Bowden, to the companions by Dennis Pearson and to the chapter by Barry Jameson. Chris presents Barry with flowers and good wishes. Gary presented Barry with a cheque for the amount of £750 to the MCF 2021 Festival. This entitled the chapter to a Grand Patron Certificate, which was presented to the three principals by Barry, who took great delight in his duty. The business of the evening was enhanced by an unusual occurrence: the field promotion of John Gregory to the exalted rank of Past Provincial Grand Scribe Ezra. The look of surprise on his face as this was announced was a delight to behold. This deserved and feted occurrence was celebrated by all present. The ceremony was followed by an installation dinner of minestrone soup, cod mornay, braised lamb shoulder with fresh fruit salad. Following the meal Dave Goddard conducted a Chorley raffle, which raised £135. During his speech, Barry congratulated Andy Barton on his forthcoming promotion to Supreme Grand Chapter and congratulated Gwilym and Derek for their work as DCs. 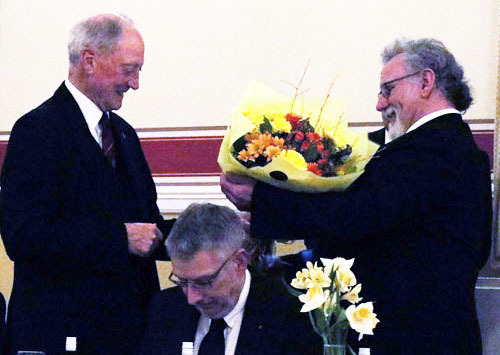 He thanked the high ranking and acting officers who had supported him on the evening; celebrated the chapter for the work and congratulated Derek Bowden and John McIntyre on their forthcoming promotions to Past Provincial Grand Scribe Nehemiah. Barry made special note of the work done by members of this chapter in the demonstration team which was taking the enhanced ceremony around the region. 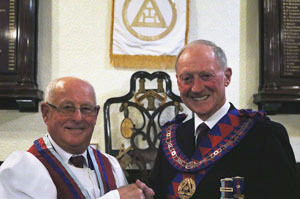 As part of his closing, Barry took a slightly different tack in calling not only for increased membership of the Royal Arch, but also in making strenuous efforts to retain existing companions. More speeches, good news and some less so, good food and good company; an evening that was a pleasure for all there. The three principals with their guests.